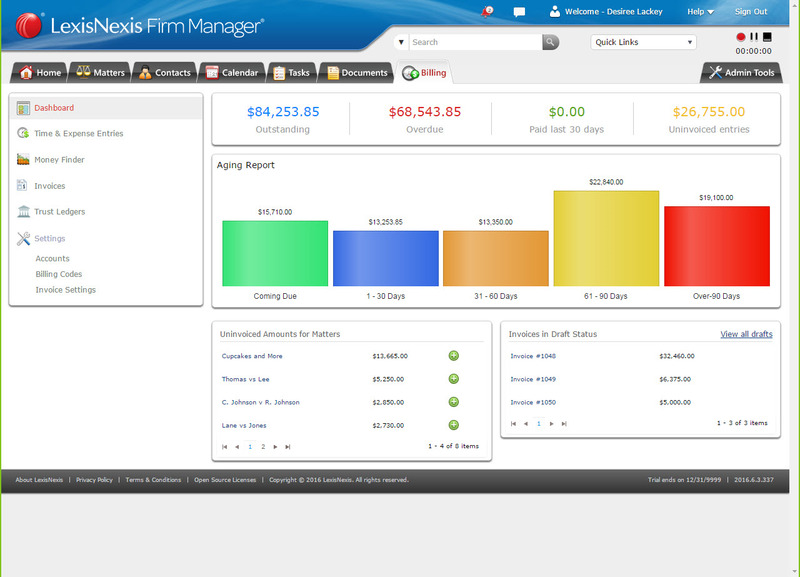 Firm Manager, the cloud-based practice management platform from LexisNexis, today introduced a new two-tiered subscription model and new features to go along with the new pricing. The Starter plan, at $29 per user per month, which includes case management, calendar syncing with Google Calendar and Microsoft Office 365, billing, simple trust accounting and document management. The Essentials plan, at $44 per user per month, which includes all of the above, plus role-based permissions, QuickBooks integration, a variety of reports, and customizable templates for intake and workflow checklists. Previously, Firm Manager had one subscription level for which it charged $44.99 per month for the first user and $29.99 per month for each additional user. Role-based permissions. This feature allows a firm to control access to different features and functionality within Firm Manager based on a user’s role within the firm. There are three levels of permissions: Admin, in which the user has full access to everything; attorney, in which the user is limited in access to some billing, accounting and reporting features; and staff. in which the user is limited to only the user’s own matters, time keeping and expense tracking. QuickBooks integration. Firm Manager now integrates with both QuickBooks Online and QuickBooks Desktop. The integration allows synchronization of your financial information between the two applications. Anything that happens with regard to an invoice in Firm Manager — payments, discounts, taxes, credits, etc. — is mapped to the firm’s QuickBooks account. Checklist templates enable users to track progress on a matter. Customizable templates. Firm Manager now offers two types of templates: matter-intake templates, to help ensure you collect all necessary information when starting a new matter, and checklist templates, for creating task lists for different types of matters to help ensure you do not miss critical steps. Firms can create their own templates for whatever practice areas they handle using a variety of generic and practice-specific fields that can be dragged and dropped onto the template creator. Firms can also add their own custom fields. While some other vendors’ intake templates can be sent to a new client to allow the client to fill them out, Firm Manager does not yet allow this. I was told last week that this functionality is on the product roadmap to be added in the future. The checklist templates can be used to track progress through the various stages of a matter as well as to track the time spent on a matter against the budget for that matter. When creating a checklist template, the user can assign time and budget estimates for each task. Firm Manager then tracks the actual time spent against the estimates. The billing dashboard provides a visual overview of invoices and their status. Reporting and visualization tools. 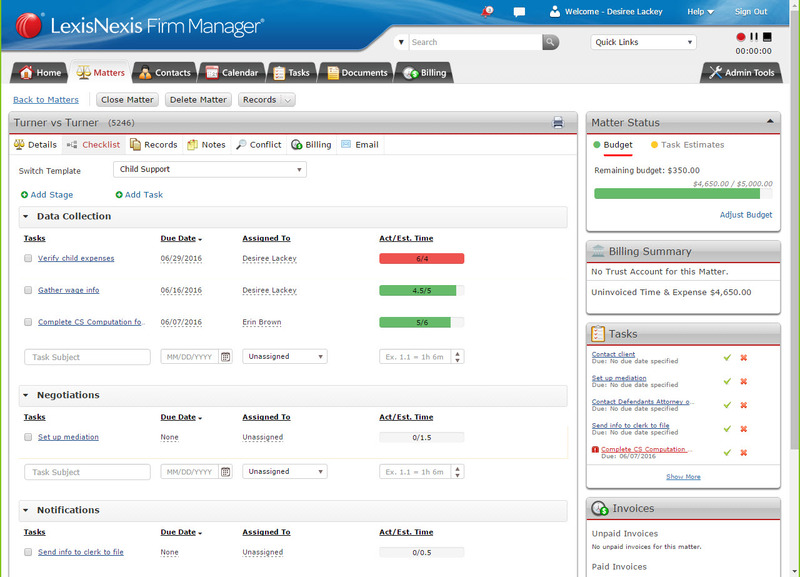 Firm Manager now includes a set of tools for generating billing and financial reports and visualizations. The platform now also includes the ability to track aged accounts receivable by matter or client. The ability to apply a credit or write-off to an invoice. The ability to set up multiple trust accounts. 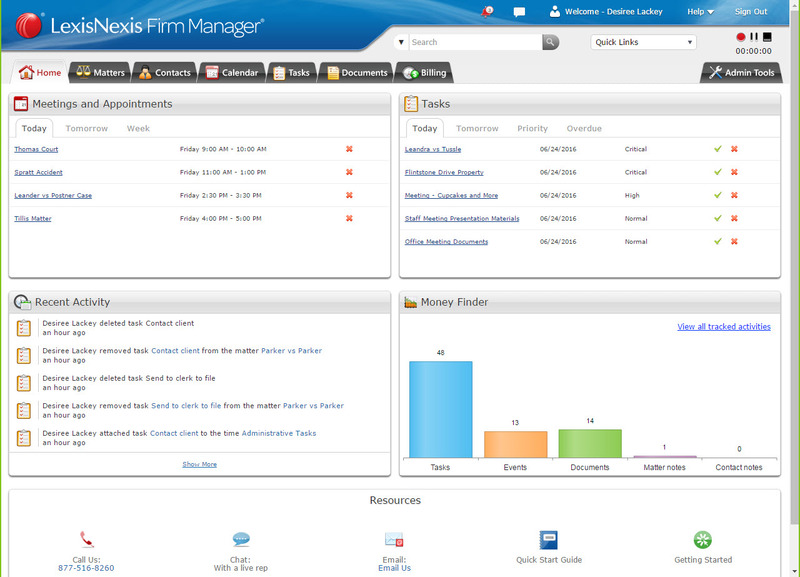 LexisNexis is calling this new release Firm Manager 2.0 and it is available as of today. For more details on all the features, see the Firm Manager website.